Ford today officially confirmed that it would be producing the Lincoln MKT and equipping it with the EcoBoost 3.5-liter V-6 engine, good for an estimated 340 horsepower and 340 lb.-ft. of twist, in place of a V8. Unlike the MKT Concept, the production crossover will get three rows and probably fewer Saworvski crystals. A "fuel-efficient" six speed will be the transmission of choice for both the EcoBoost V6 and the standard issue, normally aspirated 3.7-liter V6. The new 7-passenger CUV, which will debut at the 2009 Detroit Auto Show, will feature technologies such as SYNC, blind spot monitoring and cross-traffic alert. Full details in the press release below the jump. PEBBLE BEACH, Calif., Aug. 15, 2008 - Kicking off the weekend marking the celebrated Pebble Beach Concours d'Elegance, Lincoln today confirms it will produce the Lincoln MKT, a premium, three-row luxury crossover based on a the well-received concept vehicle. "The Lincoln MKT reinforces our commitment to further expand America's fastest-growing luxury brand, providing an all-new vehicle to the showroom that's been crafted and honed for a new kind of customer," said Mark Fields, Ford Motor Company's president of The Americas. "The MKT will offer the comfort of a luxury sedan, the spaciousness and flexibility of a crossover and the performance of a sports sedan, courtesy of its EcoBoost engine," he added. "At the same time, this perfect blend of performance and power is elegantly wrapped in the refined design cues that have become synonymous with modern Lincolns." The Lincoln MKT will build on a string of successful Lincoln products launched in recent years. The Lincoln MKX, a two-row crossover, and the Lincoln MKZ mid-size sedan have earned high praise from consumers and continue to gain share in their respective segments. The flagship Lincoln MKS luxury sedan, introduced earlier this summer, has seen strong early sales, as well. Dynamic and clean-lined, the Lincoln MKS is the first production vehicle to embrace the strong new Lincoln design DNA. New Lincoln products, including the new MKT crossover, will feature this distinctive new Lincoln design language as well as industry-leading technologies. 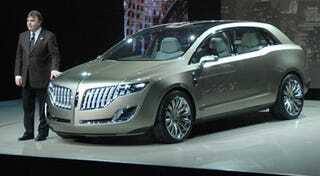 The Lincoln MKT crossover will join the Lincoln lineup in calendar year 2009, along with an upgraded Lincoln MKZ mid-size sedan - plus an additional version of the flagship Lincoln MKS sedan powered by an EcoBoost engine. In addition to a fuel-efficient 3.7-liter normally aspirated V-6 engine, the Lincoln MKT also will offer an EcoBoost 3.5-liter V-6 engine that will deliver an estimated 340 horsepower and 340 lb.-ft. of torque. The Lincoln MKT will join other vehicles early in the EcoBoost engine technology rollout, including the Lincoln MKS luxury sedan and Ford Flex. EcoBoost engines feature turbocharged direct injection technology and deliver up to 20 percent better fuel economy and 15 percent improved emissions than larger-displacement engines. In the Lincoln MKS and MKT, for instance, the EcoBoost engine delivers the fuel economy of a V-6 engine but the performance feel of a V-8. Ford is making a significant commitment to EcoBoost engine technology. Within five years, the company plans to produce 750,000 EcoBoost-equipped vehicles annually - in vehicles ranging from small cars to full-size pickups in markets around the world. "EcoBoost engine technology is another symbol of what luxury means today," Fields said. "Lincolns should drive as beautifully as they look, delivering as much refinement on the road as their designs do even while standing perfectly still." Taking cues from its performance sedan sibling and the MKT concept vehicle first shown at the North American International Auto Show in January, the Lincoln MKT will feature the distinctive bow-wave, double-wing grille; clean, uncluttered surfaces; powerful, dynamic beltline; chamfered surface running parallel to the beltline; significant D-pillar that smoothly transitions into the cantilevered roof and a powerful roofrail. "Embracing the same spirit as the concept, the Lincoln MKT's design represents harmony in motion, balancing sculptured shapes and contours traditionally associated with beautiful cars on a crossover vehicle that offers the luxury of space and efficient, powerful performance," said Peter Horbury, Ford's executive director of Design for The Americas. The MKT will provide seating for up to seven passengers and all the latest in-car connectivity technologies that customers have come to expect from Lincoln. This includes a new version of SYNC, the company's industry-leading connectivity technology that fully integrates customers' Bluetooth technologies including mobile phones and MP3 players. Plus, next-generation navigation system technology and new safety and security features will be available, including the new Blind Spot Monitoring and Cross Traffic Alert System. Working in conjunction with the blind spot information system, Cross Traffic Alert warns the driver of impending traffic while backing out of a parking spot. When cross traffic is approaching, an indicator light provides a warning in the corresponding outside mirror, as well as an audible warning. Cross Traffic Alert utilizes the blind spot system's two multibeam radar modules, which are packaged in the rear quarter panels - one per side. These modules identify when a vehicle enters the defined blind spot zone; an indicator light provides a warning in the outside mirror corresponding to the side in which the vehicle is approaching. The system can pick up an object moving at up to 18 miles per hour within a 65-foot range - or three parking spaces - from either the left or right side of the vehicle. The Lincoln MKT will be manufactured in Ford Motor Company's Oakville Assembly Complex in Ontario, Canada. Additional product details will be made available closer to the Lincoln MKT's launch.